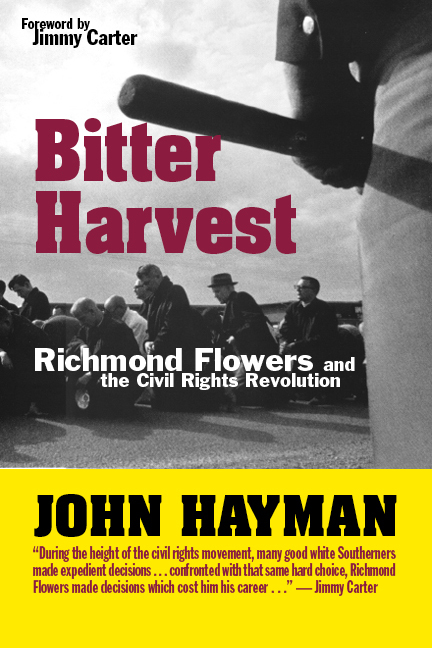 Bitter Harvest traces the development of Richmond Flowers, a color politician who began his career as a segregationist but who, as Attorney General of Alabama, fought bitterly against Governor George Wallace in trying to support the Constitution. In the process, he sacrificed his political career. Flowers was elected Attorney General in 1962. A likable storyteller who had served in the state senate, Flowers came into office promising like the rest to send the Yankees a message. He did not seem the stuff of which heroes (or martyrs) are made. But faced with the choice of upholding the law or of taking the popular course, he chose to uphold the law. Events thereafter made him a central figure in the most violent years of the civil rights revolution. The book sets this story against the background of the Southern war against civil rights, a savage contest motivated by hatred and fear. It advances the thesis that during this period, Alabama suffered a fundamental failure in leadership which determined the state's response to the demand for social change. Alabama's leaders encourages lawlessness with their statements and actions. They took the state down a self-destructive course which has had lasting and damaging consequences.